On September 28th, 2013 in Monaco, Harry Winston is taking part in the Only Watch charity auction organized by the Monegasque Association against Muscular Dystrophy (AMM) under the patronage of HSH Prince Albert II of Monaco. Keenly aware of the gravity of this pathology and eager to affirm its commitment to children, Harry Winston has developed and produced an exclusive timepiece for this exceptional event: the Harry Winston’s Only Watch 2013 Midnight Big Date. Recognized as the world’s first charity watch auction, this fifth edition of Only Watch will feature an exceptional array of 40 of the greatest watch brands. Following an international travelling exhibition of these timepieces in Singapore, Hong Kong, Shanghai, Beijing, New York, and Geneva, the auction will be conducted at the Hotel Hermitage in Monaco, under the leadership of the auction house Antiquorum. Harry Winston senses particular affinities with Only Watch. By supporting research for Duchenne Muscular Dystrophy, a degenerative neuromuscular disease affecting 250,000 children, adolescents, and young adults around the world, the brand confirms its commitment to childhood and to life in general. Loyal to the spirit and legacy of its founder, the House is indeed involved in specific philanthropic efforts through the Harry Winston Hope Foundation to support education worldwide. This year, Harry Winston is dedicating an exclusive model from the elegant Midnight Collection to the Only Watch initiative. The spirit of the Midnight Collection is that of sophistication, executed with the brand’s unmistakable style, and with all the dedication to perfection in the smallest detail that is synonymous with the house of Harry Winston. Right at first glance, the Harry Winston’s Only Watch Midnight Big Date embodies the quintessence of watchmaking, imbued with a sense of authenticity and refinement. 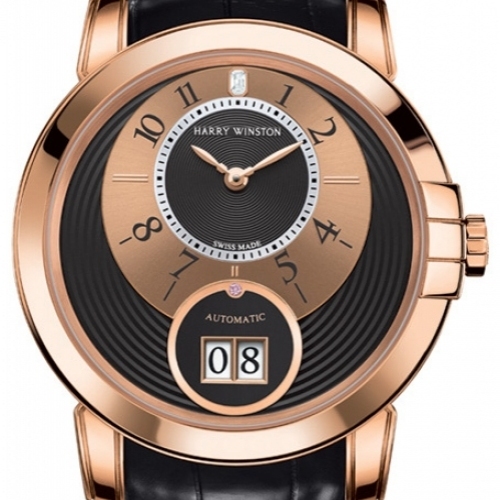 Topped with a bezel discreetly bearing the three iconic arches of the Harry Winston Fifth Avenue salon in New York City, the case is crafted in 18K polished rose gold. Its 42 mm diameter frames a mechanical automatic winding movement composed of 297 parts, with an 18K rose gold skeletonized rotor, circular grained and hand-chamfered, visible through a sapphire-crystal display back. Endowed with a 72-hour power reserve, this sophisticated timepiece features an inherent visual balance that adds both elegance and readability. It hosts a black, broad snailed-finish dial, which moves outward like an off-centered ripple, emphasizing the sleek and contemporary elegance of this model. Following Harry Winston’s aesthetic codes, the excentered chapter ring is placed at noon and features a discreet baguette emerald-cut diamond (0.019 ct) at 12 o’clock. The arrangement offers each element a prime place and gives depth to the dial, offering the leading role to a large date that takes an uncompromising stand at 6 o’clock. A single brilliant-cut pink diamond (0.005 ct) is perched discreetly above the large date, reminding connoisseurs of Mr. Harry Winston’s habit of keeping one his gems in his pocket for the sheer pleasure of rolling it between his fingers. Dedicated to a noble cause, this unique model chooses understated elegance to better highlight the sophistication of the time indications and will doubtlessly appeal to collectors of fine watchmaking who appreciate exceptional craftsmanship.